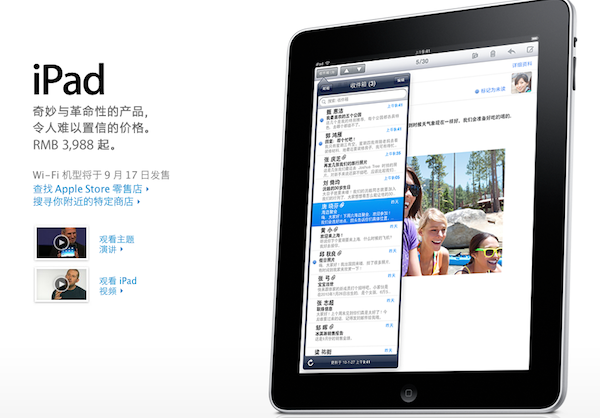 Apple today announced the world’s largest consumer market, China, will be getting the iPad on September 17th. As of yet there seems to be only iPad Wi-Fi models making their way to the country, as 3G models will take extra time in order to gain government approval. The Wi-Fi iPad will be available through Apple retailers in China for a suggested retail price of CNY 5588 for the 64GB model, CNY 4788 for the 32GB model, and CNY3988 for the 16GB model. Apple Retail Stores will offer a free Personal Setup service to every customer who buys an iPad at the store, helping them customize their new iPad by setting up their email, loading their favorite apps from the App Store?, and more. Apple Retail Stores in China are also hosting special iPad workshops to help customers learn more about this magical new product. I thought they already had it. I guess this means another bump in Apple’s stock.